Your conveyor system is the heart of your distribution center. Maintenance downtime means less product movement, which means less money flowing in and out of your distribution center. Our extensive line of products, such as POWERTWIST, PowerMax, T-Max and Eagle, all have proven track records of decreasing maintenance downtime and improving efficiency to keep your facility running at its maximum potential. Quickly and permanently replaces endless rubber belts on Belt-driven Live Roller Conveyor systems. Lightweight, corrosion-resistant composite design for years of maintenance-free service. High quality material and stringent quality testing assures longer lasting belts that reduce operating costs. Don’t be fooled by the copycats; we’ve got the real thing. Always is stock, ready to go to you! 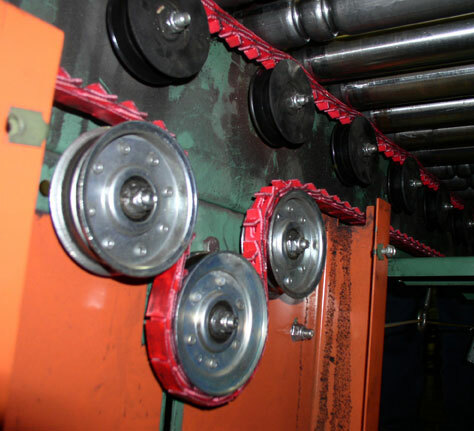 Reduced downtime as belts are easily installed in seconds with no tools and without dismantling line shaft or rollers. Quickly connect in position with easy to use metal or plastic connectors – no welding required! Popular 3/16” diameter always in stock, ready to ship to you! *non-stock sizes can be made in a week or less. Replacement O-rings for line shaft, live roller conveyors and light-duty transfer conveyors. Popular sizes available for same day shipping; rapid turnaround on all custom sizes. Reduced downtime through eliminating the need to manually retension your drive systems and quicker belt installation. Solutions for the floor, and the roof! POWERTWIST belting is ideal for HVAC applications and will outlast rubber V belts in the harshest conditions. See cost savings through fewer belt replacements and reduced inventory. Permanent replacement V belt – just fit it and forget it! PowerTwist Roller Drive is your Zero Downtime Solution for your live roller conveyors!